Bring Founding Fathers style to your wardrobe with this tie that honors America's revolutionary history. Bring Founding Fathers style to your wardrobe with this silk tie that honors America's revolutionary history. 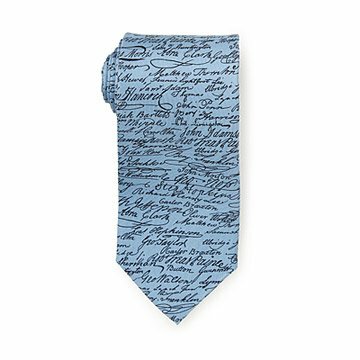 The patriotic blue tie features the signatures of those who "pledged to each other their lives, their fortunes and their sacred honor" in signing the Declaration of Independence--including Jefferson's, Adams', Franklin's and of course, Hancock's famous flourish. Designed by Josh Bach, each design is printed on fine, imported silk and then hand finished. Made in New York. My partner is getting his citizenship in a couple of months and I wanted to mark the occasion with something special. This not only suits it perfectly, but it's unique and of great quality. It's great not to sacrifice anything in the search of 'unique' and I think it's something he would wear to work regularly and beyond this special day. My dad loved this tie! It has signatures from the people who signed the Declaration of Independence, not the document itself. Great quality! My dad loves it! My son teaches history so I thought he could wear this to school. The tie was fine. No box? The tie was fine. However, very disappointing that it didn't have a box with it for the price that was paid. Loved the tie, great craftmanship! My husband loved it as well. He's a taller guy so I wish the tie had been a little wider but it still looks great! My dad will be reading the Declaration of Independence on the courthouse steps on July 1st. This tie will be perfect for the occasion!